Labels are getting a bit of an overhaul in this version. 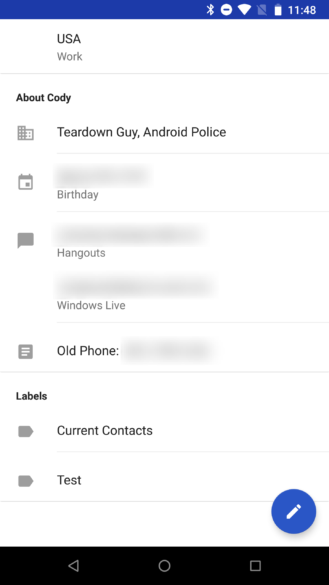 On older versions of the Contacts app, they were stuffed at the very bottom of the page and displayed as a continuation of the list. They basically blended in with everything else on the page with a gray icon. The latest update gives more prominence to labels, both pushing them up the page and giving them a distinct look. The change in design is probably the most important thing here. 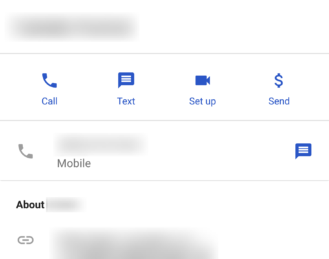 Instead of line items, they're now represented as bubbles similar to tags in Gmail (without the colors). They've also done away with individual lines for each label and allow them to wrap so they'll take up less vertical space. The new location isn't too big of a change, labels only moved from below the About section to just above it, but that's still underneath all of the actual contact methods. 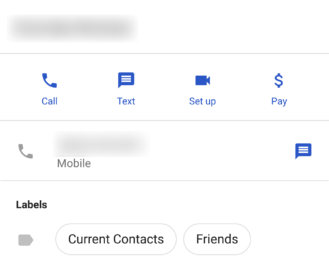 Of course, if all you have for somebody is a phone number and an email address, labels might be visible without scrolling now. They also do a little bit to provide visual distinction between the contact methods and the About section. I'll mention one other minor tweak. If you look at the money symbol, you'll see the caption was renamed from Send to Pay. Version 2.5 of the Contacts app revealed that a "cleanup wizard" is in development. 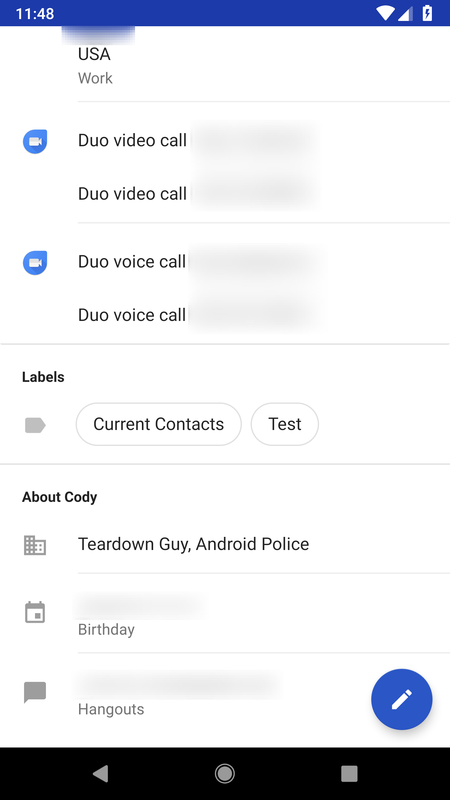 It's likely this is just a more elaborate and friendlier interface for the current Suggestions screen, which already directs users to merge duplicate contacts, import backed up contacts from old phones, fill in certain contact details, and so on. The last teardown included just the skeleton for what would be the cleanup wizard, but in the latest update, the progress is much more tangible. What was once just a single container layout is now joined by eight additional layouts. There is also quite a bit of new text beyond just a title. Update (referred to as 'repair' in the string names) – Updates contact information that may not be formatted correctly or has problems related to country codes. Merge (called 'duplicates') – Combines two or more contact entries for the same person into one single contact. Delete – Looks like it probably just clears out empty entries. Also as a small bonus, there is an image that appears if you have zero suggestions from the wizard. It's probably not worth mentioning, but there was one other oddity that popped into view. It seems that there's something related to the way Motorola phones format phone numbers that requires a special touch. An internal switch has been created with the name motorola_disable_phone_number_formatting, and it's set to false for all devices except those with the mcc722 and mcc724 designation, which I believe to be the Motorola XT919 RAZR D3 and RAZR HD. 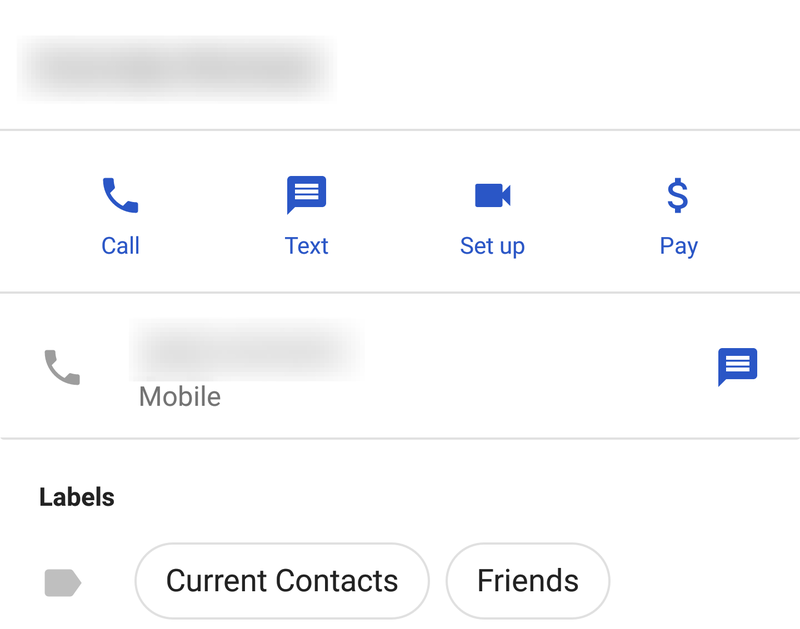 Evidently, something about the way those phones format their phone numbers is problematic, so it's ignored in the Contacts app.